I’ve been doing more continuous integration lately, both remotely using Jenkins to manage jobs and locally with tools like autotest and Guard. 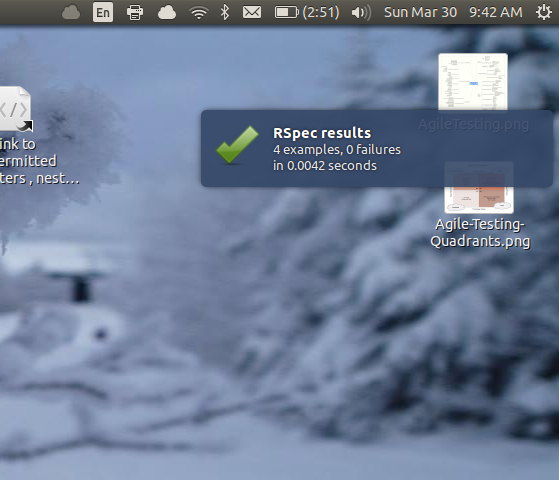 I liked autotest but for new projects I couldn’t get it to run correctly. I switched to Guard and that worked. So I needed to update my tmux installation. But first I needed to update my Ubuntu version from 12.04 -> 12.10 -> 13.04. Done. Then I tried multiple versions of tmux – 1.7, 1.8.4 and 1.9a, compiling locally but couldn’t get any to run correctly. Finally I found that with tmux I really needed to restart / logout as just closing all terminals apps wasn’t enough. Entire trip took a day but I had the time available and the upgrades were all tasks on my to-do list for long-term maintenance. It was also complicated by the fact that frequently when I changed my tmux or .bashrc setup, new terminal windows wouldn’t start. Sometimes I had to edit my .bashrc file in gedit (basic text editor) to comment out the exec tmux line, just to get terminal access back!